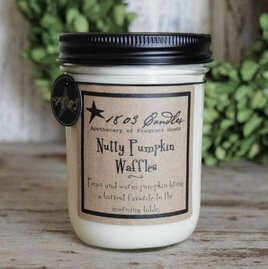 The 1803 Yummy Pumpkin Candle is an autumn inspired scent of your favorite treats, This Fall favorite scent of spiced pumpkin, gooey caramel, sugared nuts, and toasted marshmallows is expertly poured into this soy jar candle. 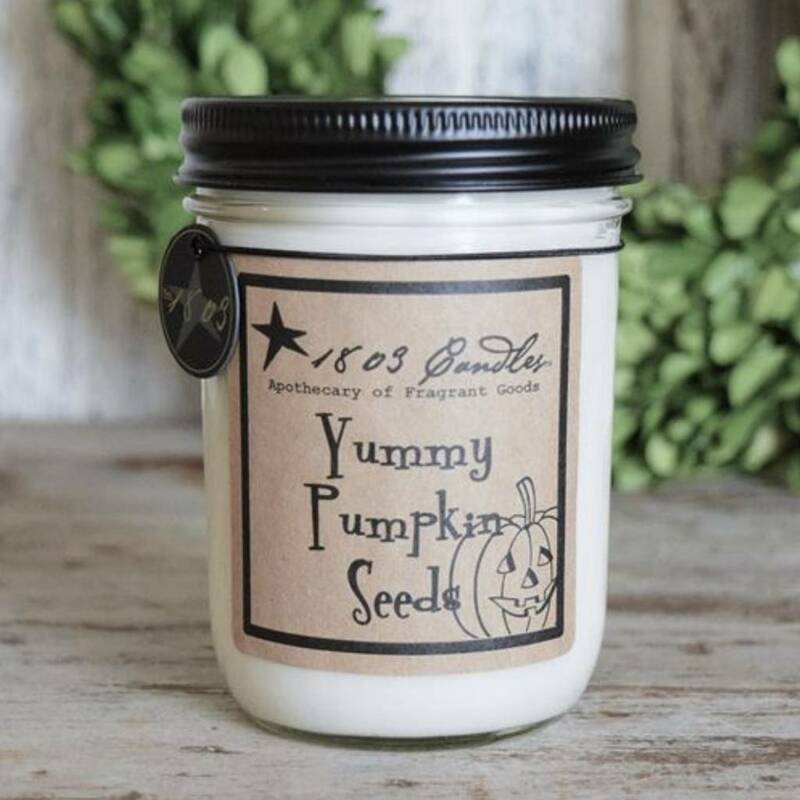 Thank you for choosing to shop with us and considering our selection of 1803 Yummy Pumpkin Seeds Candle! The 1803 Pumpkin Hollow 14 oz. Candle has baking spices mixed with fragrant pumpkin that greets you as you walk in the room. It captures the enticing fragrances of gooey caramel & sugary drips of maple blended with pumpkin, cinnamon, & nuts. 1803 Tavern Maple Candle is a decadant warm spoon bread with Tavern Maple bourbon, topped with luscious sweet cream. This savory dish is sure to tempt your taste buds! Just imagine the scent floating thru your home. The 1803 Pumpkin Cornbread Candle is a scent like mouthwatering, buttery, pumpkin-infused cornbread. This Soy Candle in it's Butter Jar creates the perfect autumn aroma of golden baked cornbread with pantry spice and honey pumpkin. 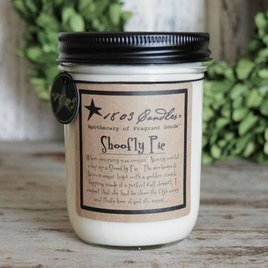 The 1803 Shoofly Pie Candle... a warm, sugary aroma fills the air as the pie cools on the sideboard. Notes of brown sugar blended with the deep, spiced molasses will cause your home to fill with a sweet, comforting memory. Candy Corn is a Halloween staple and this childhood favorite has been blended with gooey vanilla cream, marshmallow, and touches of almond to give you a new scent for Fall. The fragrance is unique and reminiscnet of trick or treating.